Bombastic driving hard rock peppered with moody slow burners and highly charged ballads. 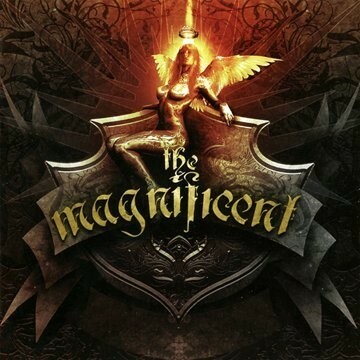 As sure as eggs is eggs, if you’re gonna have the bare faced audacity to name your band/project The Magnificent you sure as hell better had be because you’ll almost certainly hear the knives being sharpened in the background to tear you a new one before anyone’s even heard a note! A brand new collaboration between Circus Maximus vocalist Michael Eriksen and Leverage guitarist/producer Torsti Spoof, if you close your eyes and really concentrate you can just imagine the birth pains of some future progressive metal ‘super group’ ... erm, well not really no. A million miles from the kind of material you’d normally associate with either of the main protagonists or their respective day jobs, the precociously named The Magnificent actually prove themselves to be a rather good Scandie melodic rock/AOR act who on first listen come across as a deft blend of Brother Firetribe, Shy, Europe and Street Talk. If you’ve been paying attention you’ll already know that Eriksen is a proven class act from his work in Circus Maximus, but his soaring, velvety tones have taken to this new discipline like the proverbial duck to water! Aided and abetted by an excellent supporting cast of players which includes Thunderstone keyboard man Jukka Karinen as well as bassist Sami Norbacka and drummer Rolf Pilve; and featuring songwriting contributions from assorted members of Brother Firetribe, Leverage, Circus Maximus and Urban Tale you’d expect the result to be remarkable, and right from the get go that’s exactly what debut album ‘The Magnificent’ delivers. Offering up an ever more impressive mixture of bombastic driving hard rock peppered with moody slow burners and highly charged ballads, there’s a self assured swagger to this that becomes increasingly compelling the more you listen. The overblown mix of pomptastic keyboards, spiralling solos, crisp riffs and passionate vocals melodies harks back to the golden era of Scandie rock, yet at the same time sounds frighteningly fresh and current. You’ll be smitten as soon as brash opener ‘Holding On To Your Love’ sinks its hooks into you, and by the time your increasingly bedazzled brain encounters crescendo driven closer ‘Harvest Moon’ you’ll be as addicted as a whore on crack! Studio project such as this often have their fair share of detractors, but on the evidence of what’s put before me, I have to say they’ve done a sterling job here!